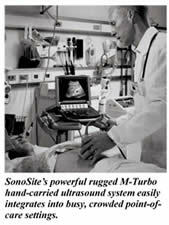 Day 1, Q4, SonoSite announces its next-generation ultrasound the M-Turbo, the MicroMaxx successor. I think most of us expected to see it only at RSNA, but apparently SonoSite was ready for this and is looking to make a big impact in Q4. I haven't yet seen it live, but I'm interested to see how this stacks up against the MicroMaxx... particularly because the underlying architecture is quite different than past SonoSite machines. One of SonoSite's problems and benefits in the past was its use of the VXWorks operating system, which allowed it to boot quickly and provided a very stable operating system. On the M-Turbo, SonoSite has moved to Windows CE 6.0 Embedded, which is a huge change that allows SonoSite to compete more directly with GE's ultrasound machines. It also allows for easy transfer of files to USB memory stick, easy setup of 3rd party printers and devices, etc. The concern has always been: what kind of boot time would it be with Windows heavy overhead? Well, SonoSite still claims a very fast bootup time, showing 15 seconds for the M-Turbo, which is an impressive feat with Windows Embedded. Apparently this has something to do with a Texas Instruments chip, but that's far out of my knowledge range. I have yet to see pictures to see if the user interface has changed or how the image quality stacks up, but they're keeping up with the technologies at this point, including MultiBeam (like GE's CrossXBeam or Philips SonoCT) and Speckle Reduction. So it appears SonoSite has stepped up its game a bit and should continue to compete against the GE juggernaut. This also means we should see some pricing changes coming down the pike to the Titan and MicroMaxx lines. And for all intents and purposes, Philips and Siemens remain quiet in this market. This is simply unreal to me. All we've seen from Siemens is an update to its outdated Cypress system (still a nice unit, but seriously!) and the Acuson P10 pocket machine. Philips has nothing, although SonoSite was started in the cafeteria of the ATL/Philips headquarters in Washington. BOTHELL, WA - October 1, 2007 – SonoSite, Inc. (Nasdaq:SONO), the world leader in hand-carried ultrasound, today announced the introduction of the M-Turbo™ ultrasound system for use in the full range of clinical applications at the point of care. 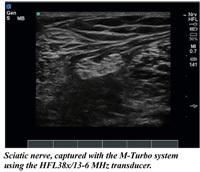 The fourth major product platform since SonoSite released the industry’s first hand-carried ultrasound system in 1999, the M-Turbo system delivers an exponential increase in raw processing power for superior image clarity across all exam types, plus seamless connectivity for digital image export in a rugged, hand-carried product weighing less than 8 pounds. SonoSite plans to begin customer deliveries later this quarter. SonoADAPT™ Tissue Optimization – automatically adjusts imaging parameters depending on exam type and patient size based on imaging depth thereby eliminating time-consuming and complicated clinician manipulation of multiple controls. SonoHD™ Imaging Technology – leverages the exponentially increased processing power to reduce speckle noise and other image artifacts while preserving and sharpening tissue information and enhancing the aesthetic and clinical value of the image. SonoMB™ Multi-beam Imaging - further enhanced and now available on all M-Turbo transducers, including the phased array transducer to facilitate cardiac and abdominal examinations, SonoMB technology was first introduced in April 2007 as a software upgrade for the MicroMaxx system. Clinicians have praised its ability to increase resolution of small structures and enhance border delineation while maintaining temporal resolution. The new P21x/5-1 phased array transducer offers exceptional image quality and an ergonomic form factor for increased patient and clinician comfort during cardiac, abdominal and Ob/Gyn exams. The ICTx/8-5 curved array transducer provides a 135° field of view and broad bandwidth for improved detail resolution. At introduction, the M-Turbo system offers a total of seven transducers to cover a full range of clinical and procedural guidance applications for abdominal, nerve, vascular, cardiac, venous access, small parts and superficial imaging. In addition to the P21x/5-1 and ICTx/8-5, this suite of transducers includes the C60x/5-2 curved array; C11x/8-5 curved array; HFL38x/13-6 linear array; L25x/13-6 linear array; and L38x/10-5 linear array. The M-Turbo system increases transducer versatility and ease of use by optimizing the transducer to perform multiple exams types for a specific anatomical area, enabling a single transducer to be useful across a broader array of applications. SonoMB technology runs on all transducers, including the P21x phased array transducer. The M-Turbo system offers two transducers with exceptional depth penetration for difficult-to-image patients; the C60x transducer images to a depth of 30 cm. and the P21x transducer images to a depth of 35 cm. The M-Turbo system is the first medical device to integrate Texas Instruments’ (TI) DaVinci™ technology which is designed specifically for high performing, highly responsive digital video applications. Digital videos and images can be exported from the M-Turbo system to a USB storage device in standard PC formats MPEG4 (H.264), JPEG, HTML and BMP for review or storage on a PC or Mac® computer. With two high speed (480Mbps) USB 2.0 ports and a high speed Ethernet link, clinicians can seamlessly export digital video and images for diagnostic consultation, instruction and publishing. SonoSite engineers also integrated Microsoft® Windows® Embedded CE 6.0 operating system running on TI’s TMS320DM644x digital media processor with DaVinci technology to facilitate easy patient data management and transfer with hospital information systems (DICOM®) and to USB thumb drives. M-Turbo system to offer customers an “education key,” a library of clinically specific, point-of-care tutorials and refresher courses for playback on the system. The Education Key™ program is a thumb drive that contains a combination of system operation video tutorials, application-specific video refresher programs that provide peer-to-peer instruction on how to perform specific exams and procedures, and an image reference library of application specific sonographic anatomy for comparison purposes. This combination of instructionally rich learning tools is an industry first and continues to solidify the commitment SonoSite is making to clinical users. 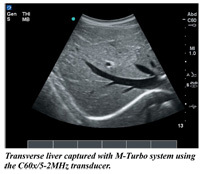 The M-Turbo system is being offered with the same, unprecedented 5-year warranty that SonoSite introduced with the launch of the MicroMaxx system in 2005, which eliminates the need for expensive service contracts that typically add another 10-15% of the purchase price to system cost per year. 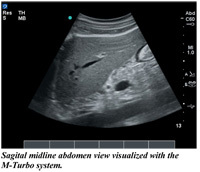 Understanding the demanding requirements of point-of-care use, the M-Turbo system withstands SonoSite’s industry-leading 36-inch drop test. Durability is built in from the ground up with the extensive use of magnesium components throughout to maximize strength and minimize weight. As with other SonoSite products, the M-Turbo system is battery operable and goes from off to scanning in less than 15 seconds. Plus, the system is easy to clean and sanitize, of utmost importance in critical care environments.